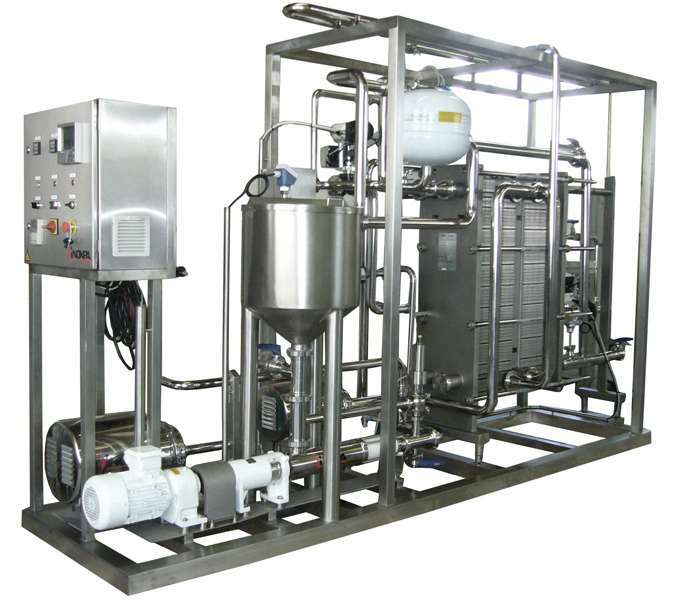 The pasteurisation unit (HTST pasteuriser) is designed for the thermal treatment of milk and dairy products as well as other food products as soft drinks and juices. The process destroys pathogenic microorganisms by heating the product to a moderately high temperature for a brief period. The product arrives to a balance tank (BTD) and is pumped to a plate heat exchanger. It is heated to a pasteurising temperature, that depends on the type of food product and/or process requirements. 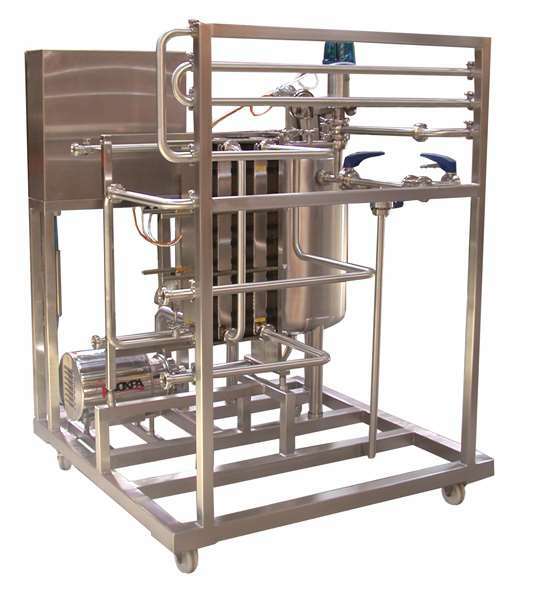 Next, the product passes through the holding tube that ensures the correct pasteurisation by holding the product at the required temperature for the specified period of time. If the heat exchanger has a regeneration stage, the treated product is used to preheat the feed material, losing heat in the process, this, reducing the energy required to reach the pasteurising temperature and in reducing the cooling required. Finally, the product is cooled to 4 ºC for cold filling or storage in isothermal tanks. 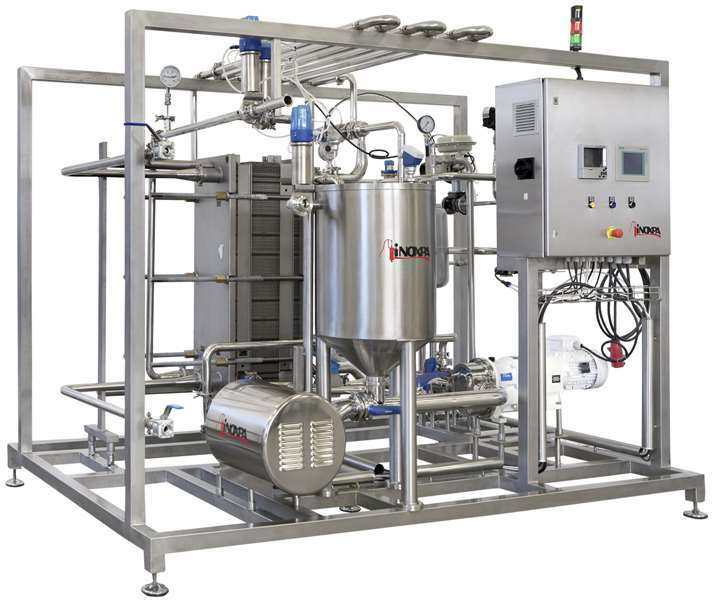 If, due to any problem, the pasteurising temperature is lower than the required one, an automatically operated flow divert valve sends the product back to the balance tank (BTD), thus, preventing any microbial contamination of the final product. - Balance tank: 100 L, AISI 304. - Feeding pump: Hyginox SE centrifugal pump. - Plate heat exchanger: 1, 2 or 3 stages, upon request or depending on the process; stainless steel frame, AISI 316L staineless steel plates (0,6 mm thick); mecanically fixed NBR gaskets. - The holding tube is slightly tilted to promote the drainage of the pump. - KH automatically operated flow divert valve (3 ways), manual butterfly valves and the instrumentation necessary to control the pasteurising temperature. - 3 way modulating valve for hot water with electropneumatic positioner. - Stainless steel frame with height adjustable legs. - For the operation of the unit, there is an AISI 304 stainless steel control panel. The panel includes a temperature regulator. The basic configuration set includes a REED type max/min level sensor in the BTD and a PT100 temperature sensor with 4-20 mA output and an adjustable 0 - 100 ºC thermometer at the outlet. If required, the unit must be provided with glycol water for cooling and with hot water or industrial steam at 3 bar. - Hot water generation circuit: hot water is supplied by a circuit of water heated while recirculated through a plate heat exchanger heated by steam. - Frequency converter, in the control panel, for the centrifugal pump. - Flow control: an electromagnetic flowmeter and a frequency converter for the discharge pump. - Cold water control includes 3 way valve, PT100 temperature sensor and a temperature regulator. 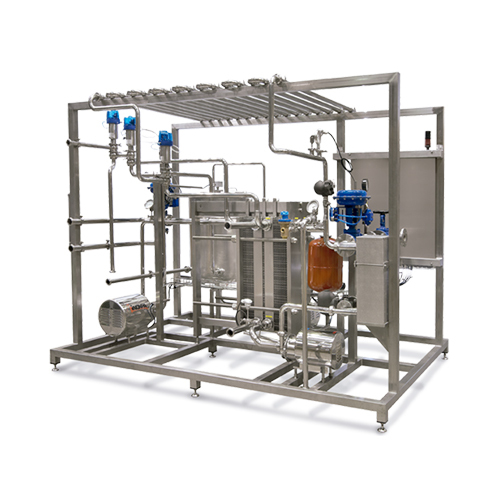 - Pasteurisation temperature and/or flow control is recorded to ensure safe production. Paper o video recorder. - Special plates for the thermal treatment of products with pulp or solid particles in suspension. - 4 stage heat exchanger for homogenisers, cream separators, etc. - Other temperature and holding time modes.